I had to replace my foundation and hate shipping charges. Its mentally less anguish if I get free shipping even if it means picking something else just to get free shipping, especially something else that is less than necessary. I have been eyeing Tata Harper’s line forever but can’t bring myself to try something, anything from it because its sooooooooooooo pricey and my skin is so finicky that for me at least the risk that it will sit in a drawer is just too high. But I did pick up this lip balm from Tata Harper and I’ve been reaching for it all the time ever since it arrived on my doorstep from Spirit Beauty Lounge. It was love at first sight, though in my head I thought it would be bigger. IDK. 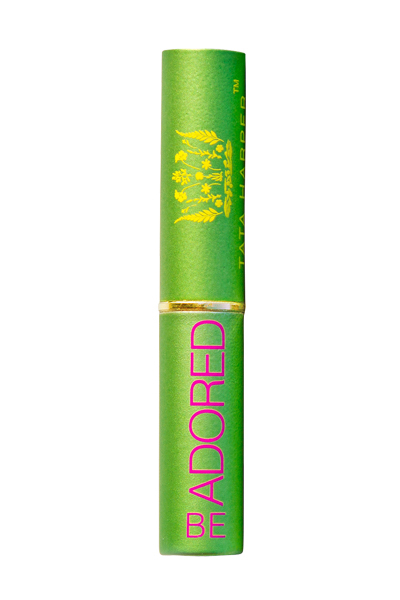 The tube of Tata Harper’s Be Adored Lip Balm is super luxe, every time I pull it out I feel like I am using some exotic specially made just for me product. Today I just realized the best part, I knew Tata Harper was all natural but this lip balm is labeled 100% Natural & NonToxic-– could I have more of a girl crush on Tata Harper? I don’t think so. My general swoon over this product was not always true. I’ve been noticing that with nontoxic lip products that the first couple of swipes are somehow off- feathering, not quite moisturizing- never really up to par. So, as with the others, I was not in love when I first put it on, but I persisted because I had a) already used it and b) it was quite expensive, even for me, for a lip balm. At first I thought it was not moisturizing and the color feathered, but like I said this is the beast that is natural lip products. After a few uses the balm warmed up and I was in LOVE. The balm is super emollient and the color, this is where my heart is, the color is perfection. Tata Harper just completely nails it– it is that totally hard to achieve natural, slightly imperceptible rosy tint. The color is not overpowering but it looks really gorgeous on and is somehow super vibrant without looking intentional.